HSFF has assembled a collection of maps of Santa Fe and nearby areas with map dates beginning in 1766 and including a few maps from recent times. These maps are posted as an aid for people who are simply curious or are researching the architectural and cultural history of Santa Fe. Use of these maps is for research purpose only. If any materials within the collection have copyrights that are retained by any individual, agency or organization, it is the researcher’s responsibility to respect these rights. The collection continues to grow as other maps are acquired. A list of the collection—arranged by date—follows. COPYRIGHT NOTICE: You may reproduce these images in accordance with the “fair use” provisions of the United States Copyright Act. The fair use exceptions are noncommercial criticism, comment, news reporting, teaching, scholarship, education and research. If you wish to reproduce those images in whole or in part for commercial purposes, it is your obligation to secure those rights. Historic Santa Fe Foundation (HSSF) provides these maps solely for research purposes. HSSF does not grant or otherwise authorize you to reproduce images of the maps created after 1909 without the express written consent of the copyright owner. 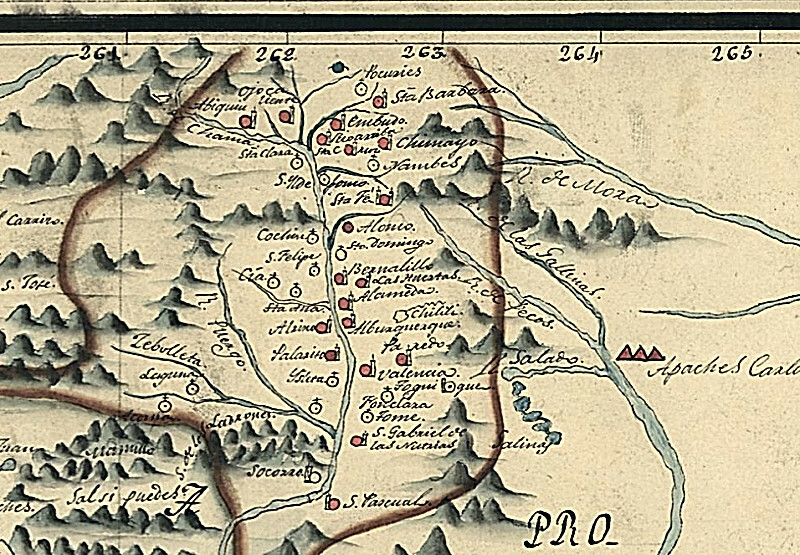 1776 Urrutia Map of Santa Fe. 1776 Urrutia Map of northern Rio Bravo. Indicates the villages and missions along the Rio Grande and Chama rivers from San Pascual in the south to Abiquiu in the north. 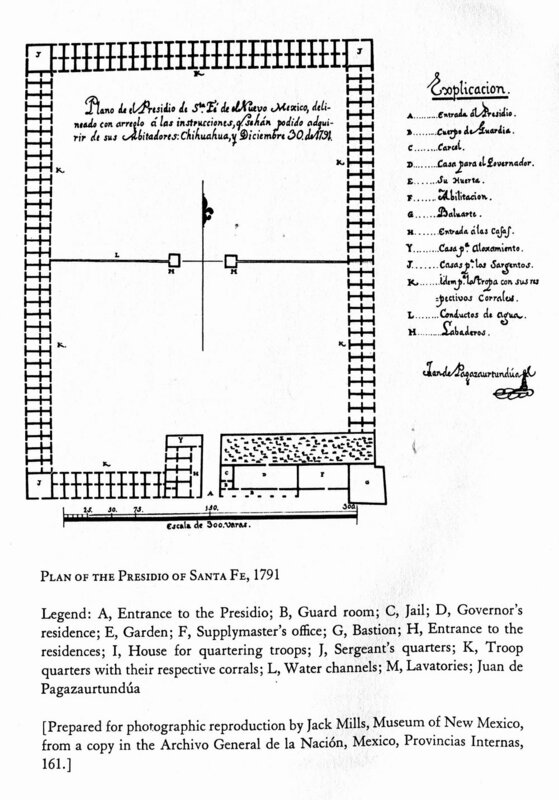 1791 Plan of the Presidio in Santa Fe. Discovered by Marc Simmons and published in his Spanish Government in New Mexico. 1816 Plan de la Iglesia Major. A very inaccurate floor plan of Santa Fe's Parroquia. 1846 August 19 Reconnaissance of Santa Fe by Gilmer. Surveyed and drawn by Lts. Emory and Gilmer. Evidently a first draft, preliminary to the 1846 Plan. 1846 Plan of Santa Fe by Gilmer. Map of Santa Fe by Lt. Gilmer, Corps of Engineers, who accompanied Kearney to Santa Fe. 1846-47 Map of Santa Fe with cienega area highlighted by Tara Plewa. Gilmer map with highlight from A Trickle Runs Through It: An Environmental History of the Santa Fe River, PhD Dissertation, 2009. 1877 Plat of the City of Santa Fe Grant. 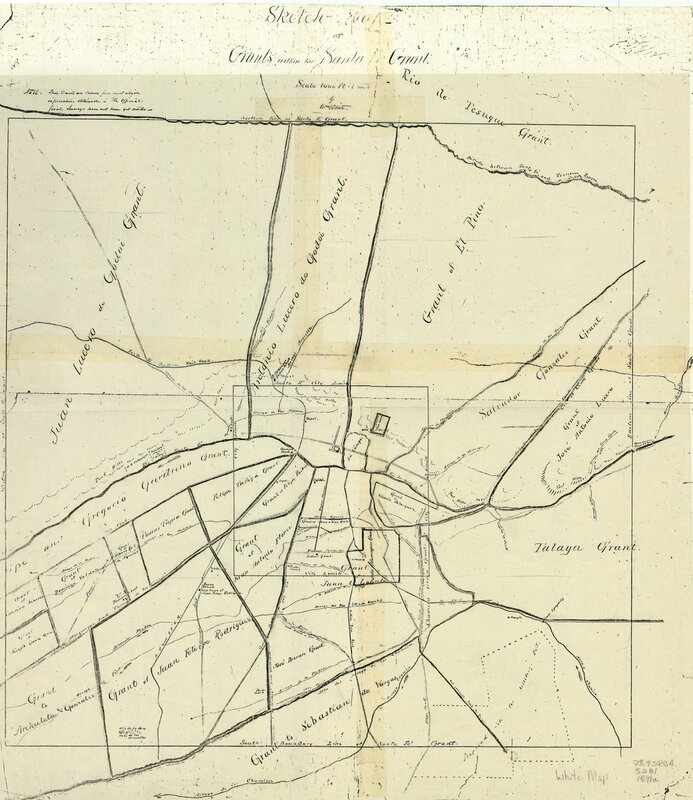 Survey of the city, with limits at one league from the Plaza, surveyed by Griffin and McMullen, deputy U./S. Surveyors, September, 1877. 1882 Map of Santa Fe by P.O. Gaynor. Shows many street names, subdivisions and prominent buildings. 1883 Sanborn Maps of Santa Fe. 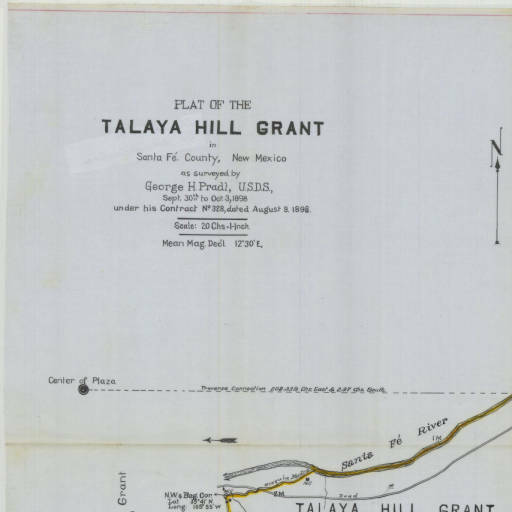 1891 Sketch Map of Grants within the Santa Fe Grant by Wm. White. Preliminary to plans to expand the city limits. 1904 Official Topographical Map of Santa Fe, New Mexico by John L. Zimmerman, County Surveyor. Shows mining districts, railroads and some grants in the county. 1951 Aerial Photograph of the Southeast of Santa Fe.